THIS is one of my favorite recipes! 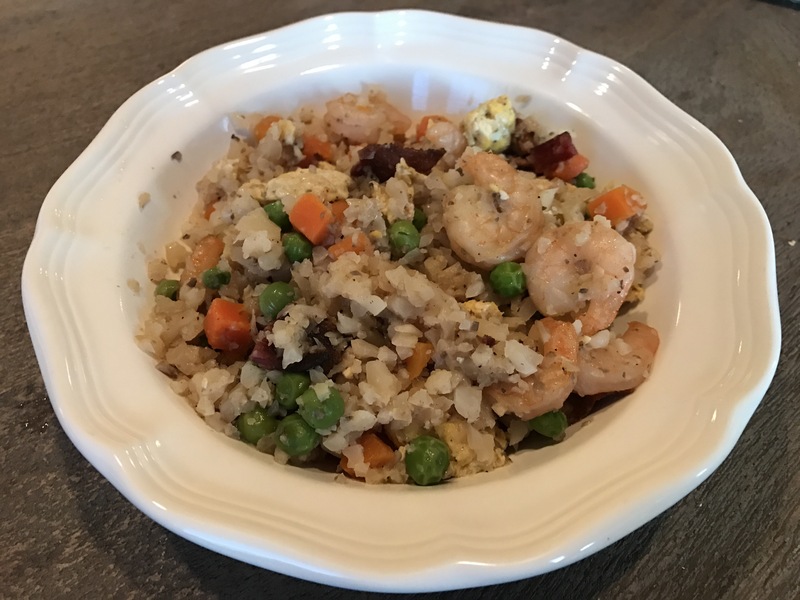 I compiled this fried rice recipe during my first round of whole30 after reading through a few different recipes and just combining everything I liked from them, and just by trial and error! It’s so easy, good leftover, has mushrooms hidden inside, and full of flavor! That’s a lot of wins in my book! Definitely put this one on your meal plan and be ready to keep it on rotation! It’s that good! Before I start, I place my frozen shrimp in a colander and leave it under running warm water for them to defrost. Add 1-2 tsp. of ginger, maybe more depending on your tastes, and stir. In a separate pan, scramble your two eggs and then add them to the larger skillet. Crumble the 2-3 strips of bacon into your skillet, trust me, don’t skip this step! Place your frozen cauliflower into a food processor or Ninja Chopper, and process into rice grain size pieces. 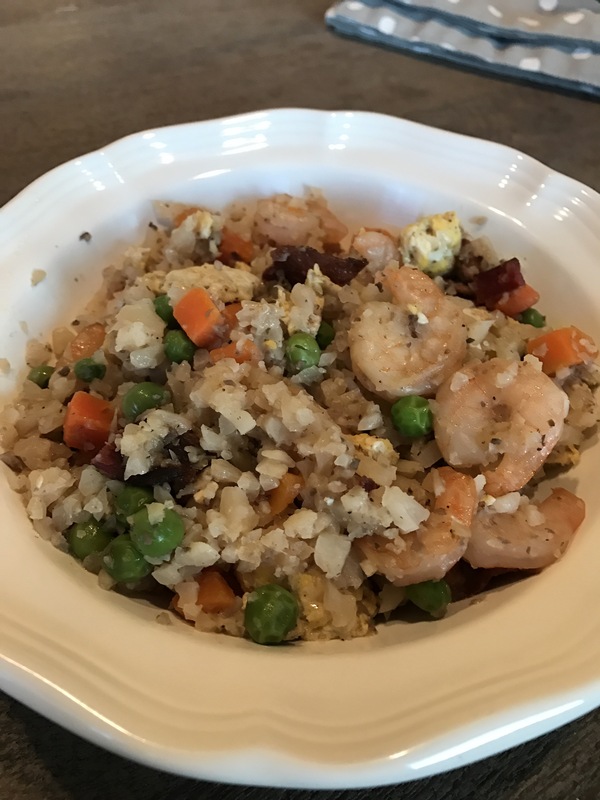 Add the cauli rice to your shrimp, veggies etc. and stir, allowing it to cook through. I add the coconut aminos here. I probably add more than some may like so just taste it here and there and see if you want more or less. You may also want to add some more sea salt now that the cauliflower rice is in your skillet. Once it is cooked through, scoop some into a bowl and enjoy! I usually roast some butternut squash in the oven, it is a great side to this dish! This is the brand of coconut aminos I pick up at the grocery store! Previous Whole30 Round 3 is coming!